Higher education facilities around the US are facing the challenge of aging laboratories inside existing buildings — some with historical value and importance to the campus fabric. One such laboratory building that faced this challenge was the Sterling Chemistry Lab (SCL) located on Yale University’s Science Hill. 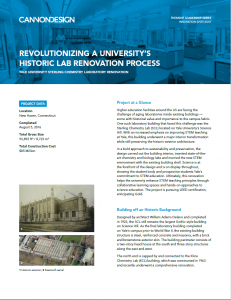 With an increased emphasis on improving STEM teaching at Yale, this building underwent a major interior transformation while still preserving the historic exterior architecture. In a bold approach to sustainability and preservation, the design carved out the building interior, inserted state-of-the-art chemistry and biology labs and married the new STEM environment with the existing building shell. Science is at the forefront of the design and is on display throughout, showing the student body and prospective students Yale’s commitment to STEM education. Ultimately, this renovation helps the university enhance STEM teaching principles through collaborative learning spaces and hands-on approaches to science education.